My version of the nuxie1 Hackaday Competition Entry (a PIC18F2550 development board). The nuxie1 Hackaday Competition Entry is a microcontroller development board. 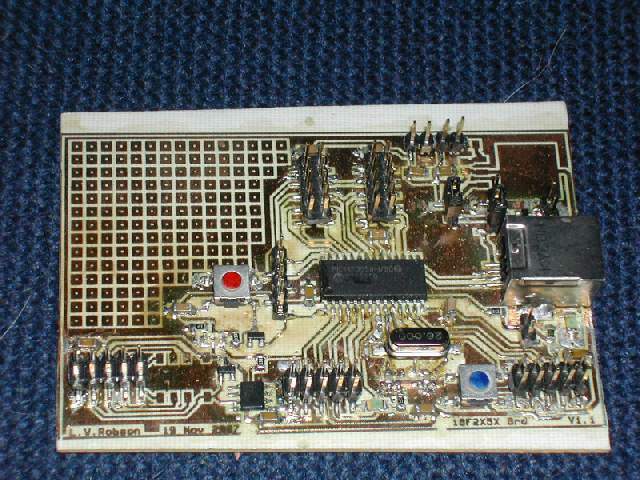 It uses the PIC18F2550 microcontroller and a modified version of the Microchip USB bootloader. It allows a fast development cycle by allowing programming of the PIC through the USB interface built into the PIC itself (after you’ve put the bootloader into it the first time using ICSP). It has a certain amount in common in that respect with the Arduino. 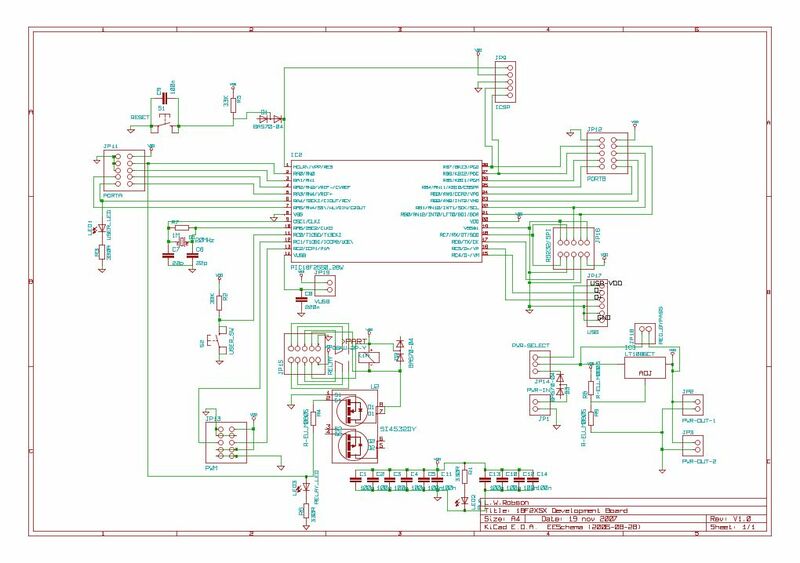 After seeing nuxie1’s comments on hackaday, I was inspired to try porting his board to Kicad from Eagle and experience all the fun/challenge of routing the board manually on a single sided board using no jumpers or vias. I should probably mention at this point that his board is much better looking than mine and comes in more through-hole/smd/hybrid versions. My version of this development board has a few extra pin headers for ease of plugging things in and a relay for driving bigger loads. Here’s the schematic for my version [ps], [svg], [jpg]. And here’s the whole KICAD project source if you fancy rolling your own. PortA – use as a 6 pin port. Note that pin A0 is connected to the relay. PortC – has no header for the complete port. pin C0 is used for the switch which puts the board into bootload mode. With all of that in mind, here is the PCB artwork. It is mirror image (which is what you want for toner transfer or transparencies anyway). [ps], [pdf]. If you want the KICAD source, it’s in this ZIP file. To use the board, you will need to put this bootloader on it using a PIC ICSP programmer.